The open concept of the 310 sq ft counter is base on the concept of an aquarium decorated with sea stars. The inviting blue ocean-inspired walls sparkle with exuberance of tiny lights that accentuate the breezy simplicity of the varied offerings that boast beneficial marine ingredients. Most of Sorabee products are water-based giving users like you and me intense moisturisation minus the icky and sticky sensation that has many other beauty labels seem to have at times. Rich in collagen and minerals, the potent combination of Sorabee’s various offerings aids in naturally combating skin problems, repairing damaged skin cells and promoting skin elasticity. 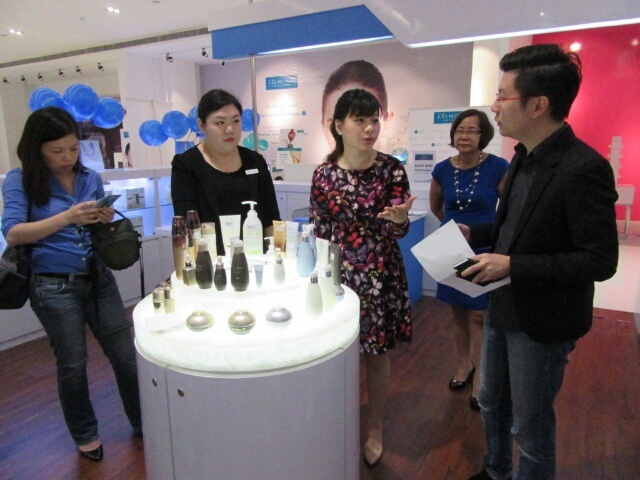 This premier Korean beauty brand which is manufactured by Amaranth Cosmetics first made its presence felt in Malaysia in 2014 and since then, the brand has been growing from strength-to-strength. 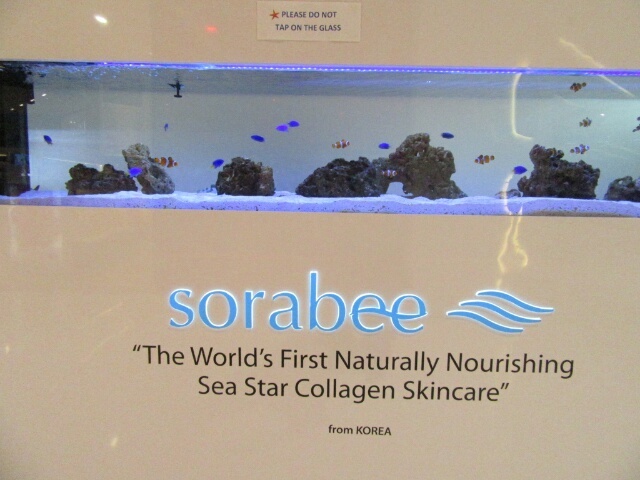 It is after all the first company in the world to successfully extract a high quality collagen from sea star, which is a very important skincare ingredient. Sora means “Sea” and Bee is “honey” in Korean that in its essence translates as “honey from the sea”. Sorabee products are amazing and is for both male and female and spreads across all age groups. Sea Star Collagen provides a glue-like matrix that holds the cells together inside our body. 70% of the skin corium is comprised of collagen, it functions to refine skin’s texture, assists the skin to look young and radiant as well as helps improve elasticity. 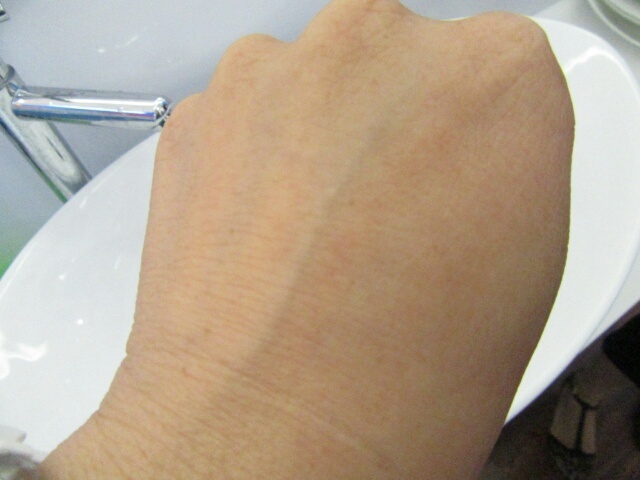 Starting at age 25, the rate of body's own natural collagen production in the skin gradually declines. As aging progresses, the signs of skin aging becomes visible where more wrinkles and fine lines appear around the eyes caused by collagen loss and lack of moisture. 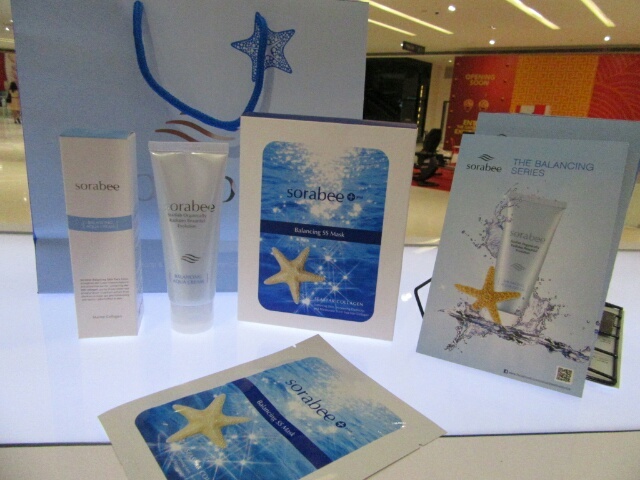 The collagen extract from sea star is ideal to shield skin from daily exposure to harmful elements and keep skin’s moisture balanced as well as enhance skin’s elasticity. Sea star collagen has been proven to give better moisturisation compared with bovine collagen, it effectively replenishes collagen and reduces the appearance of fine lines and wrinkles around the eyes. Deep Sea Water exists in depths below 200m from sea surface, where sunlight cannot penetrate and the water temperature rapidly drops away. The deep ocean circulation is a constantly moving system, called the Ocean Conveyor Belt and is driven by density differences and temperature variations. It takes about 2,000 years for sea water originating from Greenland (North Atlantic Deep Water, NADW) to travel to the coast of Hawaii, where non-polluted pure seawater is drawn from the depth of 915m. The Ocean Conveyor Belt is crucial to the base of the world’s food chain. As it transports water around the globe, it enriches carbon dioxide-poor, nutrient depleted surface waters by carrying them through the ocean's deeper layers where those elements are abundant. The nutrients and carbon dioxide from the bottom layers that are distributed through the upper layers enable the growth of algae and seaweed that ultimately support all forms of life. Deep Sea Water is characterised by its high purity, as it has never been exposed to pollution, harmful microbes and chemical spills. The purest deep sea water is rich in different minerals such as magnesium, calcium, zinc, selenium, manganese and others. The mineral-riched ingredients help to empower the skin’s self-purification system and body metabolism. Besides, it is also an effective acne treatment and helps relieve atopic skin. Porphyridium Cruentum Extract (Ocean Spa Plankton Extract) comes from planktons that live in the ocean spa. The Ocean Spa Plankton has defensive powers and self regeneration strength to survive in the ocean spa with poor surroundings. Porphyridium Cruentum Extract contains a wealth of nutrients such as galactose, glucose, mineral, etc. It enhances more than 45% of skin’s own Moisture Barrier Component to keep your skin intensely moisturised, supple and radiant. 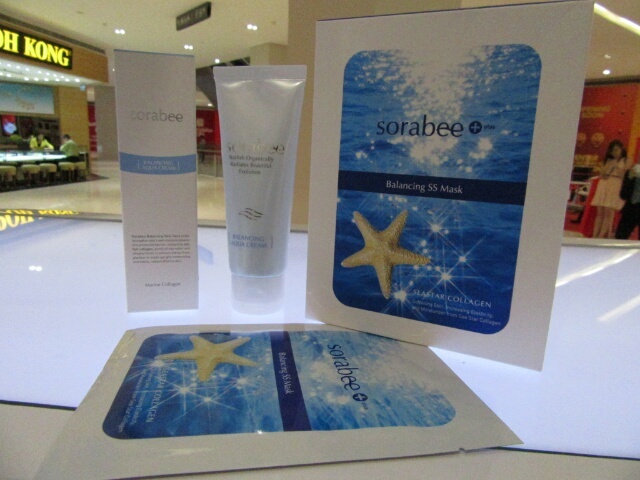 Sorabee Skin Care products are rich in natural ingredients such as sea star collagen, deep sea water and other beneficial marine ingredients, making its products one of the best for protecting your skin from environment stresses, rejuvenating your complexion and strengthen your skin’s resilience and moisture, making you look younger and more radiant. 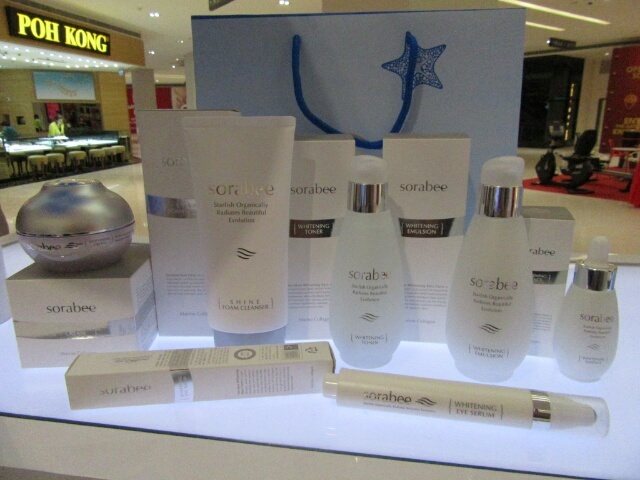 Sorabee Skin Care series are suitable for skin of all ages. working synergistically to repair damaged skin, brighten and deeply moisturise the skin. Vitamin B3 (Niacinamide) replenishes the level of ceramides and fatty acids in the skin and prevents moisture loss; while the potent hydrating agent Hyaluronic Acid works to replenish collagen and elastin in the dermal layer, hydrates the deeper layers of the skin, firms skin and prevents sagging. This is especially created for people who have rough, pigmented, exhausted and stressed skin; for those who wish to have fairer, radiant, supple, firm, moisturised, evenly textured and beautiful skin. 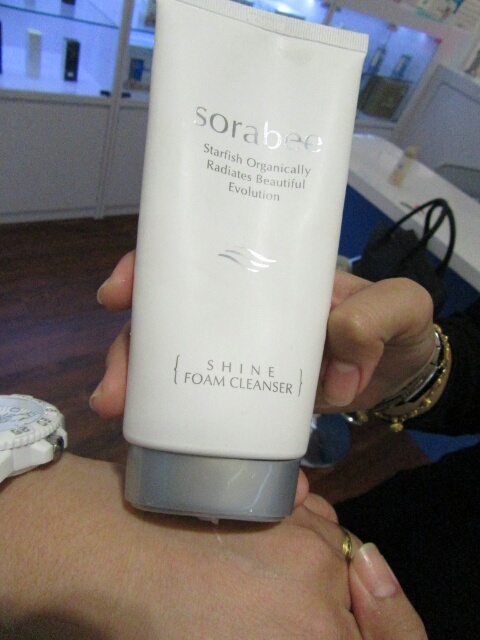 I got to try out the Sorabee Shine Foam Cleanser. 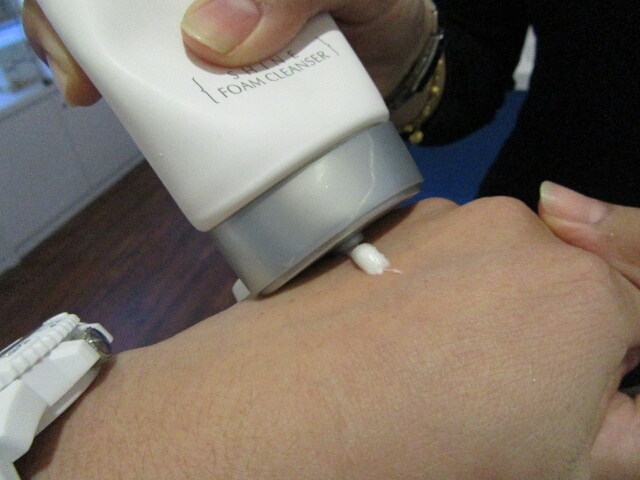 This quasi-drug foam cleanser is effective for acne skin. 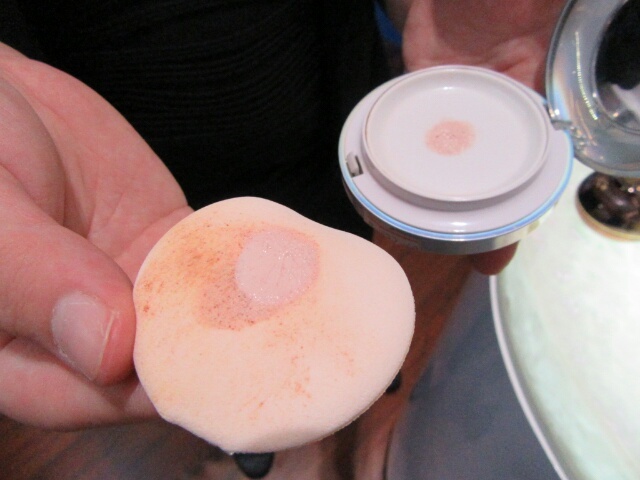 It cleans gently and throughly, leaving your skin feeling fresh. It is also very suitable for adjuvant therapy for minor skin diseases. 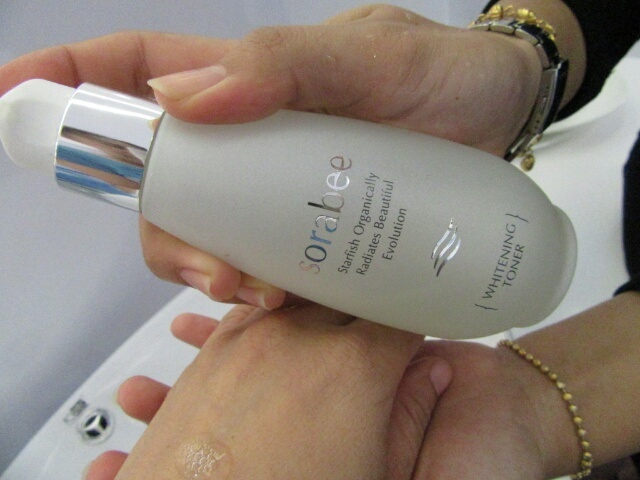 The Sorabee Whitening Emulsion on the other hand replenishes skin's moisture rapidly and helps maintain delicate and smooth skin.!!! Malaysians like you and me work, play and live in a humid and hot weather environment, which speeds up skin aging, generate pores with oily skin and causes pigmentation with uneven skin tone. Not only are Sorabee products ideal for us Malaysians, the range of products are all very accessibly priced between just RM63.60 and RM121.90!!! Deep Sea Water encourages purification, balances and enhances skin clarification and Sea Pool Plankton boosts moisturisation and enhances skin revitalisation. 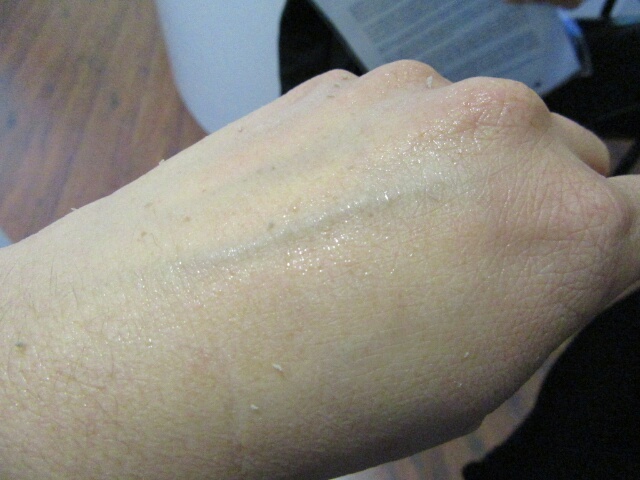 Suited for all skin types, especially skin suffering from dehydration, dullness or fatigue. Provides intensive nutrients and protects delicate skin area from wrinkles. Be sure to try the Balancing Cleansing Lotion, Balancing Body Wash and Balancing Body Lotion too..I heard that it is great on eczema skin!!! 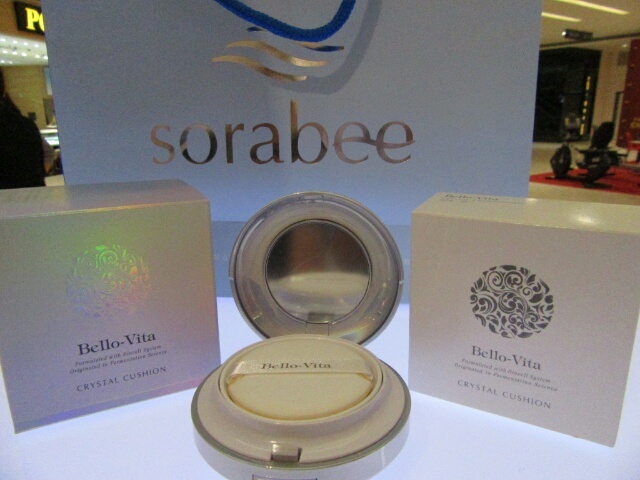 The Perfect Solution to keep your skin beautiful as your life, The “Bello-Vita” is guaranteed to make you always looking your best! Every women dreams the beautiful life with love and happy. 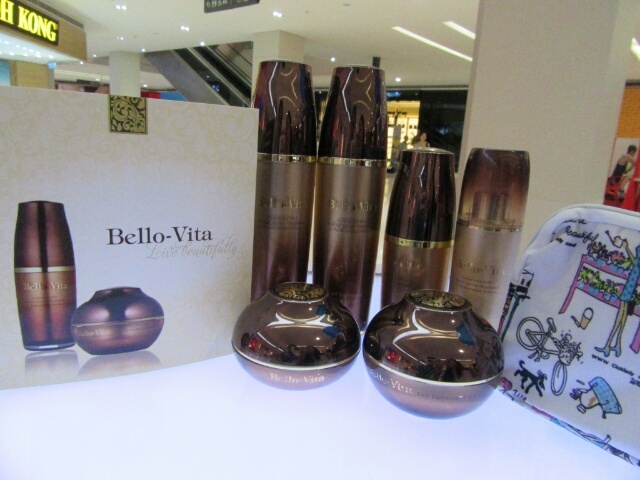 Bello-Vita is the special skin care suggestion to keep your skin youthful and glowing with health of the beautiful life. 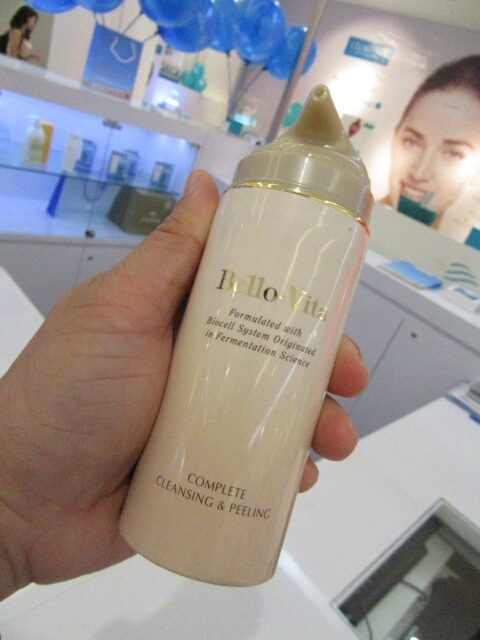 With Bio-cell System, Bello-Vita Series will totally solve your skin troubles. 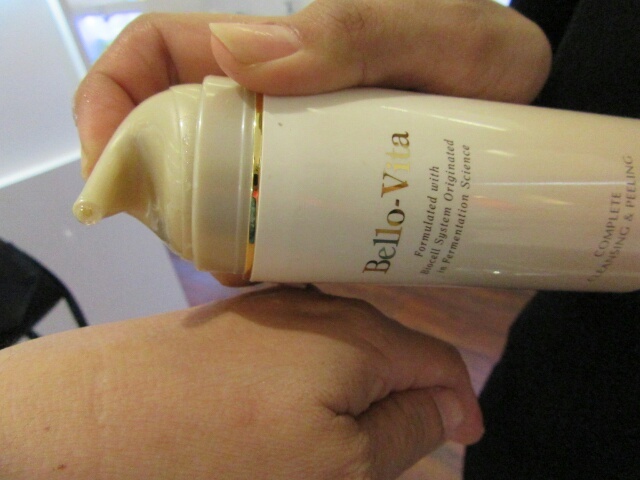 Beautiful Life, Bello-Vita will remove dryness, paleness, low elasticity, and eliminate toxins, leaving your skin rejuvenated and healthy. Natural Moisture Factors with ferment process under the low temperature, these complexes enhance skin’s own balance and give skin condition’s optimizing. 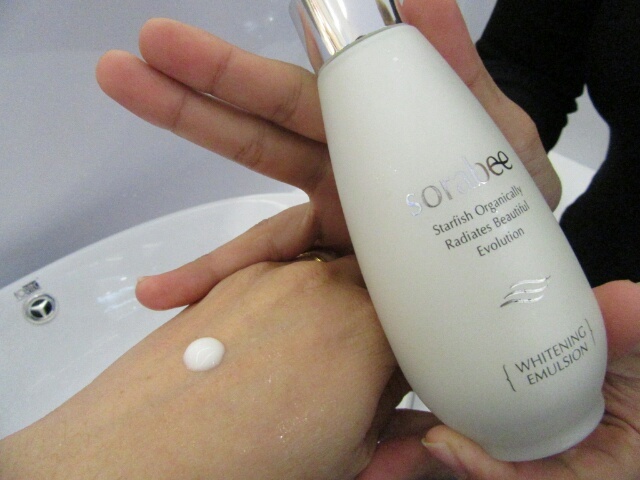 RSF Complex : Rice bran & Soybean Fermentation Complex helps promotes collagen’s activity and revitalizes your skin cell. This removes the dead cells and remains, and helps calm your skin. And RSF Complex helps to supply various vitamins, mineral, amino acid and such for your skin's health. 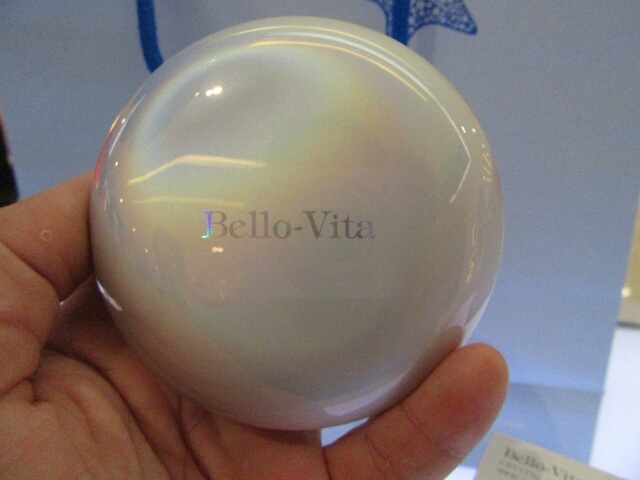 One of the products I tried was the Bello- Vita Crystal Cushion. This is an all-in-one product that has wrinkle care, whitening and UVA/ UVB block effects. Just apply a small amount of the gel to your face. 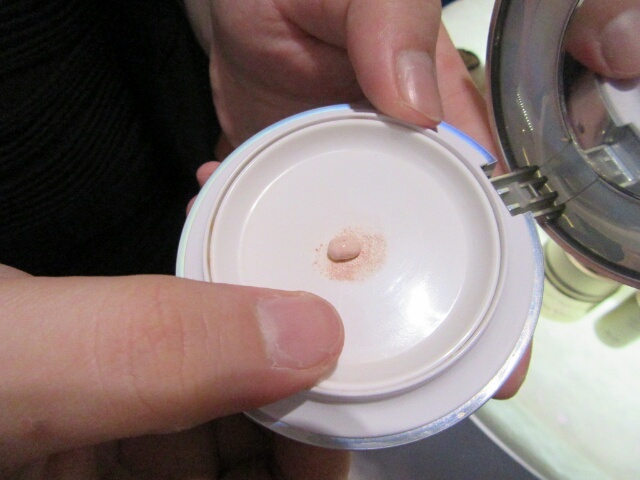 Gently massage in circular motion for 30 seconds or so and you will see dirt appearing. From deep blue sea.. Must be something good to try it out! My girl love the aquarium there haha. Wish to try this brand out soon too. wow the packaging looks so exclusive!! 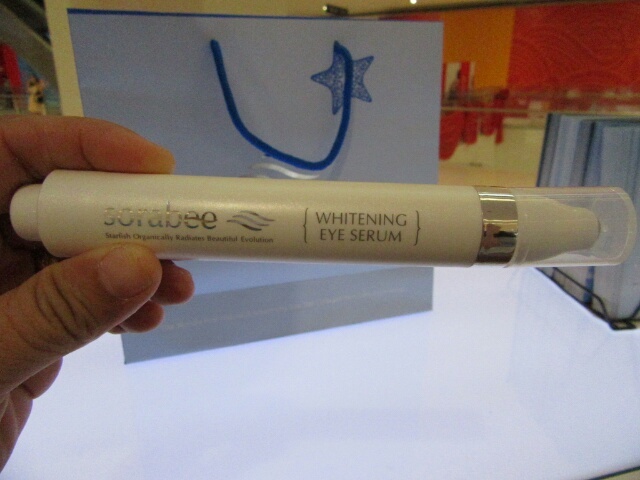 Sorabee's Whitening Series look suitable for my skin. 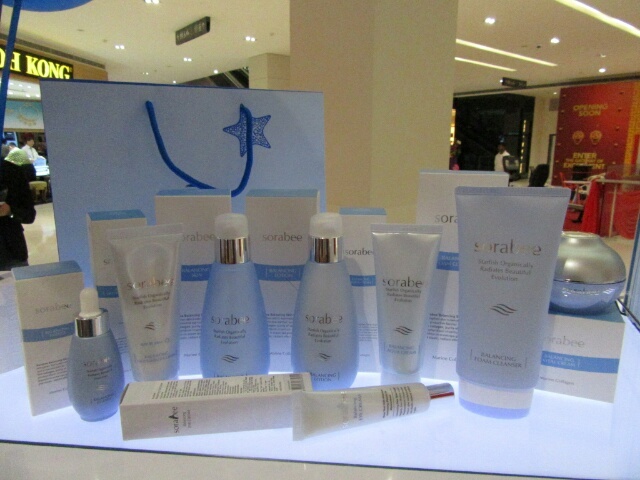 Hope it will improve my skin asap for me to celebrate CNY. 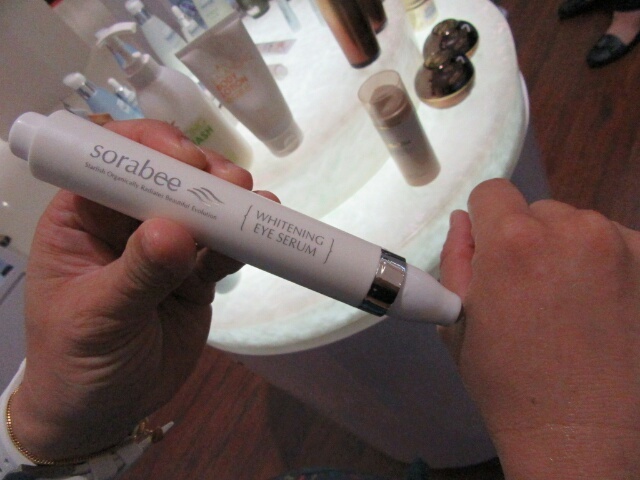 I have tried some of Sorabee skincare before and they are quite gentle on my skin. 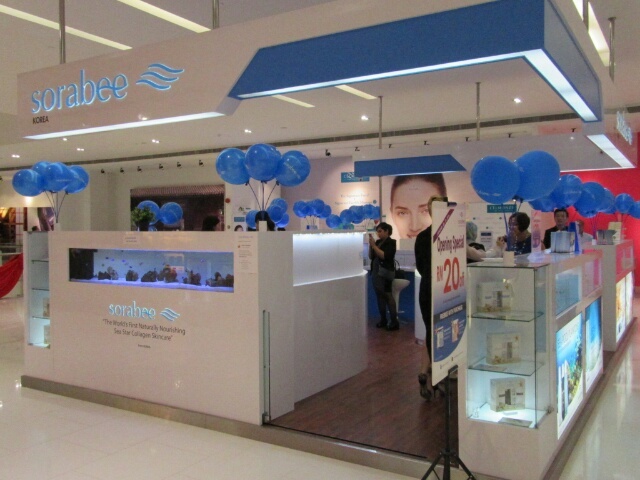 couldnt make it for this event, but i did drop by the mall, and this outlet yesterday afternoon.. very clean and proper. love the blue.